"I think that there's some level of trust that's assumed" when Eichler owners link up with an Eichler Network-referred company, said Rossi, Cal-Pac San Mateo's general manager. Homeowners can rest assured, he said, "These people know what an Eichler is—you don't have to explain it to them." Consequently, both Rossi and Smith are both well versed in the particular challenges posed to their profession, even in the considerable challenges presented by Eichler roofs and its minimal ceiling and wall space. "The biggest challenge is drainage," Rossi said of flat-roofed homes, to which his company sometimes adds tapered, rigid insulation to prevent ponding. "A large number of our [non-Eichler] clients have pitched roofs [that don't pond]," he explained, adding drily of the flat-roof challenge, "Ponding water is not a desirable thing for roofs." As for the electrical side, Eichlers present unique challenges in that area too. "Because the walls are so different," Smith noted, "you have to fish the wires through the top of the roof….There's no crawlspace in the attic [which is nonexistent] or anything like that. You have to get real creative." Furthermore, she said, the recent bankruptcy of PG&E has greatly extended the length of jobs where a panel needs relocation. "Their being bankrupt is really putting a damper on those kind of jobs," she observed, adding that electrical panels in Eichler homes often need to be moved away from gas lines. This is the kind of specialized knowledge homeowners expect out of vendors who appear in the Eichler Network's directory, not only in roofing and electrical but also general contracting, architecture, siding, cabinetry, windows and sliders, window coverings, leak detection, radiant heat, air conditioning and ventilation, solar, real estate marketing, and more. 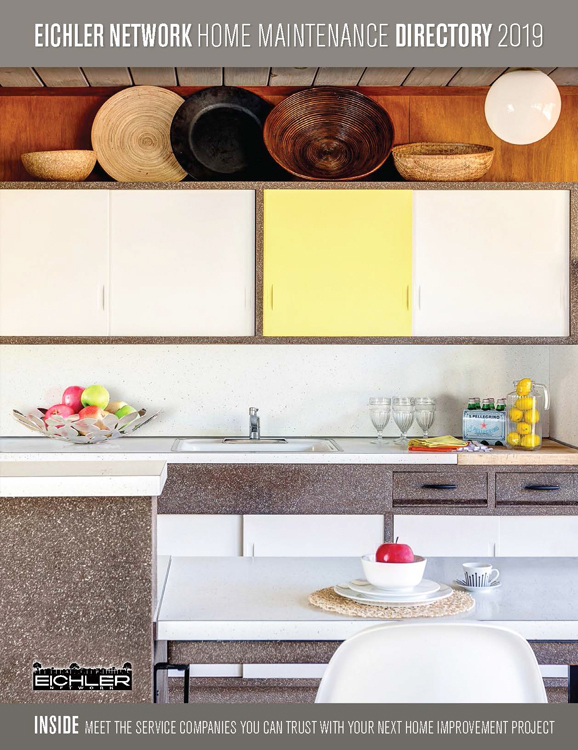 Even before consulting the directory, however, Smith said Eichler owners in general "are well educated, well read,"—and savvy that their special homes need special attention. "We do get quite a few leads that come from the Eichler Network, even though they're not all Eichlers," Rossi says. "We've discovered the Network's maintenance directory is something people go to." The print edition of the new 2019 'Eichler Network Home Maintenance Directory' was mailed free of charge to the property addresses of all Northern California Eichler homes during the last week of February 2019. To order additional print copies, click here. 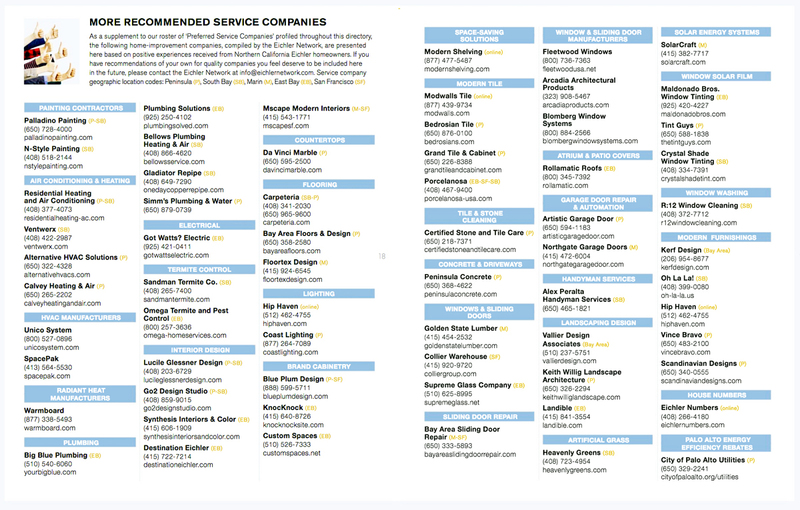 To view a free online flip-book version of the directory, click here.